Lubri Penetra dissolves and penetrates rust and corrosion to help free metal fasteners, and bushings. It lubricates, releases and protects all mechanisms. Lubri Penetra does not damage plastics, rubber, glass or metal. Jig-A-Loo’s Lubri Penetra is a super all-purpose penetrating lubricant with antifriction treatment. Lubricates, releases and protects all mechanisms. Can be used to loosen tough and stubborn parts, fasteners of all types including nuts, bolts, screws, bushings, press-fit connectors and hinged pieces can become seized when exposed to the elements, corrosive materials such as acids & alkalis and general lack of lubrication. Total equipment failure could result. Lubri Penetra penetrating spray is a unique, specialized product that works by using freezing / micro-cracking action on the affected areas or surfaces. 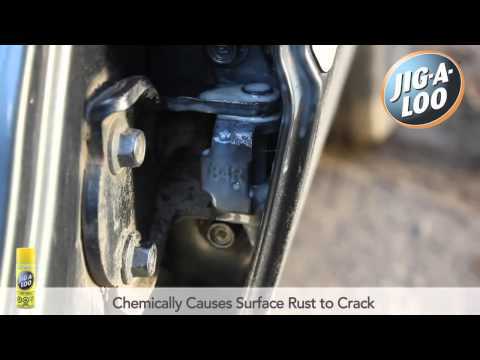 Lubri Penetra chemically causes surface rust to crack and break away, which then allows the penetrating oils to reach deeper into the affected areas. Seized parts can be loosened quicker and with less damage to the surfaces. It protects metal from rust and corrosion and more. Also useful when cleaning grease, dirt and grime. Perfect for protecting the moving parts on all your tools and mechanisms. Good in temperatures from -70°c to 160°c. Jig-A-Loo’s Lubri Penetra is ideal for metal, wood, plastic, rubber and glass. Shake very well before using. For hard to reach areas or to pinpoint a spot, use extension tube. Apply lubri penetra penetrating spray directly to corroded fasteners and parts. Allow it to penetrate the area before attempting to loosen by applying appropriate force.